The founding members of NOVOCAPTIS have many years work experience in academic, research and industrial organisations in Greece and abroad. Posts held include responsibilities in basic and applied research, product design and development and management. In early 2010 NOVOCAPTIS was established for providing cutting edge product and services in the consumer and service robotics, ambient intelligence, ambient assisted living, environmental applications, education and entertainment. There is expertise in system development and integration tasks as well as in software engineering project management and developing large software systems of high quality with traditional and agile methods. Other skills include the development of cognitive and intelligent architectures for the robotic, cognitive systems and ambient intelligence areas; engineering skills in developing systems in the micro scale; target tracking; computational vision and others. In the GNOSYS project we have developed an architecture for cognitive agents. The architecture integrates the cycle of perception-knowledge acquisition-abstraction-reasoning-action generation. The guidance for it comes from the study of the human brain and animals' non-trivial reasoning powers (primates, crows). Six cognitive faculties were included in the architecture: attention, value maps, an executive component, concepts, reasoning and motivation. 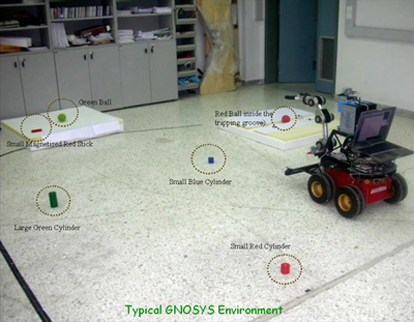 The GNOSYS system was able to perceive its environment, to form concepts of objects in it, to learn the values of objects for different uses and problems, to have the drive to learn for its environment, to build tools for solving otherwise impossible problems and to transfer its knowledge from task to task. We have created in this project the first robot ever to build and use tools for problem solving, mimicking the behaviour of tool using animals such as chimpanzees and Calidonian crows. The above work took place during 2004-2007, while working for the Computational Vision and Robotics Laboratory of the Institute of Computer Science, FORTH, Greece. The aim of the ORESTEIA project was to create a guidance system for humans, for more efficient and less hazardous living and interacting with their environment, through a set of decision-making facilities embedded in the environment and suitably adapted to the particular user. Inputs arise at low-level from a range of classes: physiological, environmental, and other such systems. There was a level of known expertise to be included, as well as some form of combination of sub-symbolic with symbolic processing in the guidance system. Also we wanted to investigate enabling technologies for ambient intelligence in the form of energy harvesting and low power wireless communications. The project developed an attention-controlled system for system configuration, of a set of artefacts in a user's environment, and graceful degradation. A user was equipped with his personal digital assistant artefact (PDA) and the ORESTEIA system collected all the input from ambient sensors in buildings and the outdoors setting and reason on it in order to provide the user with useful suggestions for possible actions in given situations. Two scenarios were of particular interest: a health monitoring (where chronic patients were monitored for a change in their status) and a hazard avoidance one for car drivers which had problems in focusing their attention, due to fatigue, disturbances or otherwise, while driving. In both cases the system provided, at a first stage, suggestions and warnings to the user while, at a second stage, took pre-emptive action to help.